I just swapped out my 249 t case with a 242 t case in my 98 jeep grand Cherokee limited with the 5.2. Everything went better then expected. Didn't even have to change out the input shaft. They were exactly the same at .840. Aside from the linkage not matching up, the 242 has an open slip yoke with a boot and the 249 had a case around the slip joint. All connections except the Speedo hooked up with the same connector but there is NO hookup for my speedometer anywhere on the 242. The 249 had it in the output shaft cone. Also I have no idea what the 242 came out of. 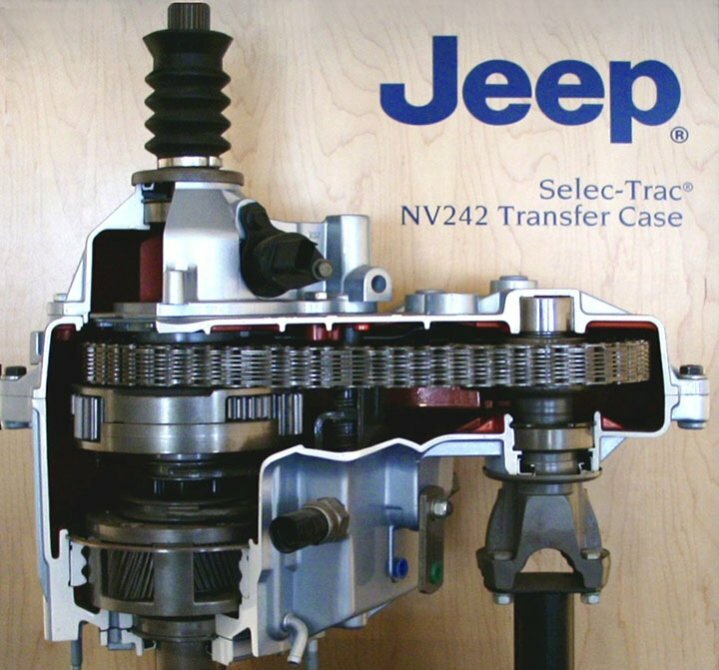 Afterror much research I believe it came out of a 99 grand cherokee that has the speed sensor in the transmission not the transfer case. So now my question is. Is there a way to bypass the speed sensor so it won't throw a code? I can't have it throwing a code due to New York State inspection rules. I cannot figure an easy solution. Black electrical tape over CEL. Or reset CEL and see how long it stays off. May be able to reset it just before inspection. Correct about speedometer sensors being in transmission on later model Grands (WJ). I have the 242 in my WJ. The tail cone has the mounts and recesses for speedometer, but the holes going into case are not milled through. You can swap tailcones with a 242 that does have speedomemer access, but I am not sure if you would need to swap the output shaft as well. The output shaft needs to have the gears cut into it for speedo. I know it can be done because I had a 242 from a WJ in my 1996 XJ. Speedometer on tailcone. I hope that someone else has the answerl. Would a 5v pulse generator work to trick the computer? Cue CCKen, BlueRidgeMark. There are a few members here that understand well the electronics on our rigs. Seems like you have a good grasp also. The only thing I can tell you is to pull the tailcone and see if the gear is there anyway. Being from a 99 it's possible they used existing parts when they put the 242 together and it still has the gear installed. If so, all you need is the older tailcone and your speedo sensor from the 249. If I remember correctly, my 97 4.0 had the slip joint in the driveshaft and not in the t/case, BUT I may be wrong. When my rear axle blew up, my brother pulled the rear driveshaft to let me drive it home and we didn't have to plug the tailcone to retain the fluid. I think it mounted on a flange with 4 bolts like an SYE. I drove it home in part-time 4wd.